Search Results for "multi ethnic business team"
Multi-Ethnic Business Team Congratulating their Leader with Successful Deal. They are Standing in Big Modern Business Office in Classical Suits. Team Work. Group Leader. Business People. 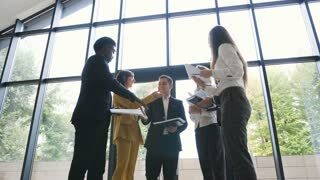 4k, Multi ethnic business team in a business meeting. Portrait of a multi-ethnic business team. 4k Multi-ethnic business team presenting proposals at video conference meeting.